The shocker continues to fly. What does it say when the architect of your win believes you only stand a 30% chance of fulfilling your first term as President? Here is why I think that barring a sudden change, the countdown to an overthrow, a post-Trump, is on. Donald Trump is in over his head. He along with his Trumpian posse are the only ones that are oblivious to the reasserting of the Establishment as they build an overthrow. In a riveting article by Gabriel Sherman in Vanity Fair, it is clear that all of the grown-ups surrounding Trump know he is unstable. Are these signs of the overthrow? Ironically Steve Bannon may be accelerating his ex-boss' demise. Even before Corker's remarks, some West Wing advisers were worried that Trump's behavior could cause the Cabinet to take extraordinary Constitutional measures to remove him from office. Several months ago, according to two sources with knowledge of the conversation, former chief strategist Steve Bannon told Trump that the risk to his presidency wasn't impeachment, but the 25th Amendment--the provision by which a majority of the Cabinet can vote to remove the president. When Bannon mentioned the 25th Amendment, Trump said, "What's that?" 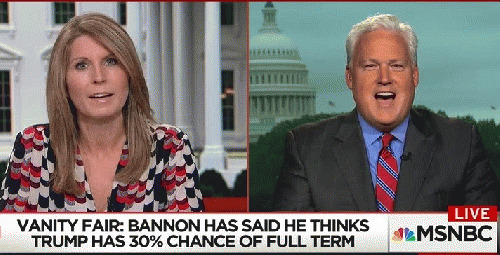 According to a source, Bannon has told people he thinks Trump has only a 30 percent chance of making it the full term. Everyone knows Trump is a paranoid thin-skinned person. Why then would Bannon talk to Trump about the 25th Amendment which in effect tells the president that he must always be looking over his shoulders with a cabinet that may be ready to overthrow him? He wants the overthrow with the expectation of destabilizing the country to fulfill his "deconstruction of the administrative state." The media is now in concert with a narrative of an unhinged president that cannot be trusted with the nuclear codes. A few respected Republicans like David Frum and Bob Corker are building the 25 Amendment case. Others are making the case for impeachment. Folks, the soft overthrow is in process. What happens when Trump supporters realize they've been had?